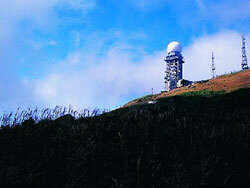 Standing 957 metres, Tai Mo Shan is Hong Kong's highest peak. Enveloping this massif is 1,440 hectares of natural territory, designated as the Tai Mo Shan Country Park. Established in 1979, the park borders Tai Po Kau Nature Reserve in the east and Shing Mun Country Park in the south. To the west is Route Twisk and Tai Lam Country Park just beyond the highway. To the north is the old valley of Lam Tsuen. Dictated by rugged terrain, mainstream agriculture never really developed in Tai Mo Shan. Villagers cultivated rice and vegetables mainly for their own use. Tea farming, however, was a thriving industry. The region was once famous for a special variety of green tea. 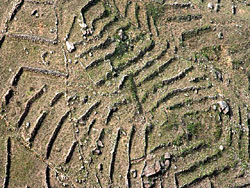 Tea terraces, arranged in chevrons, still mark the slopes today. They are remnants of tea plantations which flourished around these hills in the 17th Century. Tai Mo Shan Country Park Visitor Centre is situated on Tai Mo Shan Road, comprises an exhibition gallery and an activity room. The Exhibition Gallery is composed of six themes which introduce Tai Mo Shan Country Park, climate change in global and local perspectives, the effect of climate change in local forests, ecosystem and the effect of climate change at polar regions. The Centre is designed to provide a self-learning platform and foster public awareness of nature conservation and resources conservation. The highest peak of Hong Kong is pure volcanic rock. The southern, western and southwestern valleys are characterized by heavy deposits of alluvial soil. Given the high altitude and climatic adversities, these uplands are generally infertile. 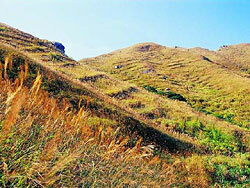 As a result, most parts of Tai Mo Shan Country Park are grass slopes, with limited forests only in the foothills. Tai Mo Shan is the coldest place in the territory. During cold spells when temperature drops to near freezing point, many people drive up here to see frost, a rare sight in sub-tropical Hong Kong. 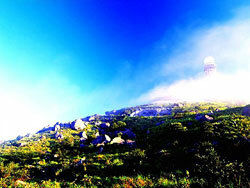 The summit of Tai Mo Shan is accessible by the vehicular Tai Mo Shan Road. On clear days, the lookout gives a spectacular panoramic view of the Northern and Western New Territories, as well as the Yuen Long and Pat Heung plains. You can even see Shekou and Shenzhen on good days. Misty days atop Tai Mo Shan is another picture altogether. High up on the mountain, the mood is so ethereal you seem to be drifting on clouds. Tai Mo Shan has the highest rainfall in Hong Kong, with 30% more rain than other parts of the territory. Fed by rainwater, rushing streams and sheer gullies cut forcefully down the slopes and merge into the Ng Tung Chai Waterfalls, a series of cascades rated one of the nine greatest falls by hikers. 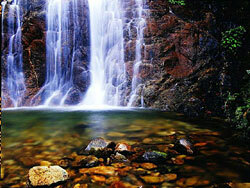 The 35m Long Falls, a famous section of the Ng Tung Chai Waterfalls, has the highest drop of all. Other sections are the Straggling-hair Falls, Middle Falls and Well Falls. Recreation and convenience facilities are mostly located near Rotary Park. They include the Tai Mo Shan Country Park Visitor Centre, Rotary Park Campsite, toilets, carpark, a hiking practice trail and the Tai Mo Shan Family Walk. The hilltop lookout offers a sweeping view of Tsuen Wan, Tsing Yi, Hong Kong Island and nearby rural settlements. About 60 barbecue stoves, Tai Mo Shan Country Park is an ideal location for group outings. 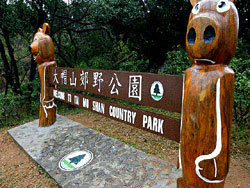 The Tai Mo Shan Hiking Practice Trail is a 1 km circular route that takes only 30 minutes to complete. Passing through a barbecue area and woodlands, it is installed with fitness test facilities and interpretation plates to provide basic hiking and safety knowledge. With such a lovely setting to train for essential skills, hiking is more pleasurable than ever. Plantations are found in the southeastern part of the park. Climatic and geographical limitations mean that forests are limited to an altitude of 550 metres. The upper slopes are vegetated mainly by shrubs and grass. Tai Mo Shan is a haven for a great variety of wildlife, with more than 100 bird species and many butterflies. 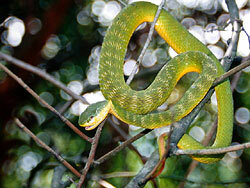 The region is also rich in snakes. Common species include White-spotted Slug Snake (Pareas margaritophorus), Red-necked Keelback (Rhabdophis subminiatus helleri), Bamboo Snake (Trimeresurus albolabris) and Common Rat Snake (Ptyas mucosus). The Tai Mo Shan highlands offer many vantage points to enjoy breathtaking landscapes of the New Territories. 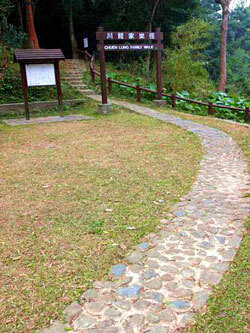 Tai Mo Shan Family Walk is a level gravel path suitable for family hikes. Starting at the country park information centre, this wooded lane is lined with trees common in the Hong Kong countryside, such as Taiwan Acacia (Acacia confusa), Sweet Gum (Liquidambar formosana) and various pine species. In fair weather, vision extends to Tsuen Wan, Tsing Yi and Hong Kong Island. On misty days when the scenery gets hazy, the mood is simply enigmatic. Within close proximity, you will find a carpark, toilets, a refreshment kiosk and a barbecue area. Chuen Lung Family Walk is a wooded path dressed by pockets of Brisbane Box (Lophostemon confertus) and lush bamboo groves. At the highest point of the walk, your gaze sweeps across Tsuen Wan, Tsing Yi, Hong Kong Island and the nearby countryside, as well as lush plantations of Tai Lam and Tai Mo Shan Country Parks in the distance. Also found in Chuen Lung is Lung Mun Country Trail, so named for Chuen Lung its starting and Shing Mun the endpoint. This green walk offers vistas of Tsuen Wan, Tsing Yi and Hong Kong Island, with the imposing profiles of Lion Rock and Beacon Hill also in view. Near the end, you come to a beguiling green domain the Shing Mun plantations.